Tacoma Public School has announced that it may close schools in order to save money. Foss is the high school they are considering and elementary schools with less than 300 students are also possibilities. These elementary schools are Franklin, Lyon, Roosevelt, Stanley, McKinley, Wainwright and Geiger. Geiger has had a program change and has been taken off the table. I thought over the next week or so, I’d take photographs of the mentioned schools and use them as my new places of the day. Today’s school is Franklin Elementary at 1402 South Lawrence Street. Their mascot is a panther. I’m sure when they constructed this school in 1998, nobody pictured it possibly closing in 2011. They educate just under 300 students. 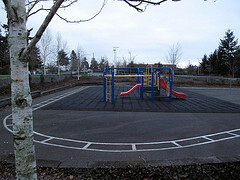 This entry was posted in Schools, Tacoma, Their future is in question, WA State - Pierce County and tagged entrance, Franklin, school, Tacoma, WA on January 23, 2011 by admin. One of the reasons I like paying taxes is that we all benefit from them. I understand those who can’t afford to pay. Fortunately I can. I wonder if I can donate to the state. Hmm.